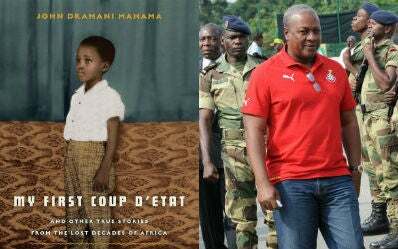 (Special to The Root) — In this excerpt from Vice-President John Dramani Mahama's book, My First Coup d'Etat: And Other True Stories from the Lost Decades of Africa, he tells the story of a boarding-school bully, Ezra, who bore striking resemblance to the dictators popping up across Africa in the 1960s. One day Ezra issued an edict. He called us all together and announced that, effective immediately, when we went for our afternoon snacks we were to bring them directly to him and he would decide what should be done with them. We were gobsmacked. Ordering us about was one thing, but now Ezra wanted us to give him our snacks! What next? How far would this situation go? The day after the edict was issued, we all queued at the dining hall for our afternoon snacks. We looked at each other knowingly as we took our portion of fried plantain. My stomach growled in anger. I was unable to bring myself to look at the snack for fear that I would eat it and then have to face the wrath of Ezra. All nine of us marched with our snacks to the dormitory, where Ezra was sitting in state. One of the students had been ordered to collect Ezra's snack for him so he wouldn't even have to leave the dormitory. He sprang up as we entered, craning his neck to see what the day's delight was. Once he saw that it was plantain, he smiled. Ezra loved plantain. One by one we walked up and stood before him, as though he were a priest offering a communion wafer — except we were the ones giving the offering. He took each of our snacks and divided them imperfectly in half. He kept the bigger "half" for himself and left us with the other "half " to eat. That's how it was from then on. We would bring him our snacks and he would take what he pleased, then send us away. He would eat some of the snacks he'd taken from us right away; the rest, he would wrap and keep under his bed. He would enjoy his loot before siesta or in the night while the rest of us were readying ourselves to go to sleep. It frustrated and angered us, but still we told no one of Ezra's bullying. We quietly let him have his way. My two very close friends, David and Agyeman, and I began to conspire on the playground. We would huddle in a corner and list all the reasons why it was unfair for us to give Ezra our afternoon snack. This was oppression, plain and simple. We would wonder aloud how it was that we'd found ourselves in such a situation. "Why should he be the boss of us?" we would emphatically ask each other. Those sessions seemed to steel us for the inevitable. We would have to confront Ezra. The three of us would meet, and we would complain and brainstorm and plan. We devised a Plan A and a Plan B; we even had a Plan C and a Plan D. We predicted every possible reaction that Ezra might have to our actions. This was serious business, and we treated it as such. We had to rid our lives of him, the ruthless dictator in our dormitory. We were merely three boys on a playground. What kind of revolution could we begin? We did not know that it was within our power to stop it, to effect change in our lives and in the lives of others. But out in the larger world beyond our campus, from the cities of Accra and Addis Ababa to the apartheid-burdened South Africa, there were men who did. Those men gathered in threes and fours to complain and plan and prepare for the moment when they would take a stand, damn the consequences. We would hear the news reports on the radio and read about them in the papers. In 1967, the African National Congress and the Zimbabwe African People's Union joined forces for armed battle against the Rhodesian army; that same year in Bolivia, a friend of African independence, Ernesto "Che" Guevara, was executed. In 1968, Equatorial Guinea, Mauritius, and Swaziland all gained their independence; several African countries joined forces with the Soviet Union and various Islamic and Caribbean nations to threaten a boycott against the Summer Olympic Games in Mexico City if South Africa were allowed to participate; the Association of Senegalese Students and the Dakar Association of Students staged a strike and boycott of examinations that resulted in on-campus riots and nearly a thousand arrests. That same year in the United States of America, another friend of African independence, Dr. Martin Luther King Jr., was assassinated. So much was happening so quickly. Africa felt like too big a subject, too expansive a continent, for us to ever fully know or understand. It seemed like a world far beyond our reach. Perhaps our season of Ezra was our initiation rite into this new Africa, one that was changing so rapidly and radically from the Africa for which our fathers fought and the Africa of which our grandfathers dreamed. Reprinted with permission from Bloombury USA. John Dramani Mahama is the vice president of Ghana.